Cyclocross is the fastest growing competitive discipline in the sport of cycling in the United States. It is a fall sport that runs from September through January. Competitors race on a closed circuit – 1.5 – 2.5 miles in length - that includes mud, sand, grass, pavement and obstacles. This sport favors powerful riders with good technical skills but also has very low obstacle to entry so is very popular with those new to bike racing. Cyclocross is extremely spectator and media friendly. Fans will often move from place to place on the course as the riders come through. Clanging cowbells and an appreciation for Belgian beers is essential! What makes the property valuable? We race for four months during a time when the cycling market and fans have their eyes trained on the sport of cross. We offer sponsors series long exposure to an attractive demographic in great markets – we don’t race in markets that are “too big” for our sport. We race where we make an impact both locally and nationally. Between strong print and web coverage and online live streaming of all of our races we reach a national and international market with repeated opportunities for sponsors to generate brand awareness and loyalty from fans of the series. What is your biggest selling challenge? As with any niche sport, it is a challenge to attract the attention of non-cycling industry sponsors without a national television broadcast package. Many. We have sponsorships with Greenware®, SRAM, Clif Bar, Bob’s Red Mill, STANLEY-PMI, Zipp, and others. What is your proudest sponsorship accomplishment? I think it has been keeping our existing sponsors such as SRAM engaged and seeing continued value in sponsorship over the years while continuing to bring in non-cycling industry sponsors such as Greenware® and Bob’s Red Mill and showing them great ROI as well. What have you found to be your most effective sales tactic? I don’t so much believe it’s a tactic as much as a philosophy. Every sponsorship should be a partnership and I try to position it as such. A long time ago I worked with a smart, smart fellow named Roger Lipker on T-Mobile’s sponsorship of the San Francisco Grand Prix and I learned so much from that experience. He taught me the value of good activation and execution strategies – and I try to bring that to each sponsorship sales opportunity. The sponsorship HAS to make sense for the company ‘s goals and I have to show them how we will help them meet them. I always try to convey during my sales efforts that I WANT to work with the sponsor on delivering for them. I do not just take a check and put up signage. That isn’t good for any of us. I believe I saw it on LinkedIn and thought it looked really promising. How would you describe the value of Professional membership? First when you are a niche sport you need to look at ALL your options for finding properties, decision makers that might be a good fit for your property. 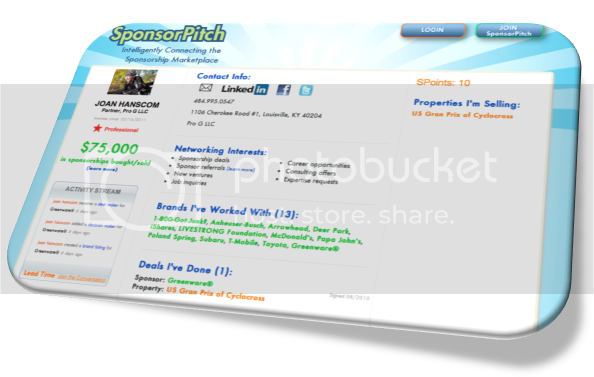 I felt that by joining SponsorPitch I would be getting valuable access to sponsors who shared a similar approach to the sponsorship profession. I also believe that you have to be willing to spend money to grow your business if the investment is a smart one. There are plenty of services I would NOT pay for. Static lists don’t interest me. The social and interactive aspects of SponsorPitch are really attractive me. It’s a living thing, not a static database. I want to read about best practices, learn from what other professionals are doing. I want to know what is happening in the marketplace. From a very self-serving point of view I would ask decision makers to take risks. Sponsoring baseball is safe and easy – which can be attractive in times of financial downturn. But by sponsoring cyclocross - or any niche for that matter- you could for significantly less money (but maybe a little more work and creative thinking) -really connect with a very desirable and loyal demographic. And be on board from the ground floor.